I don't understand why my John Deere two-cylinder tractor has a DISTRIBUTOR with FOUR terminals on the cap. It looks like this one here, but it's broken. Where can I get a NEW cap? That cap is from a Delco-Remy distributor and it is an "all purpose" cap. Only the TWO terminals that your tractor uses are "live". If you need a new one of these caps, you can get one from Davenport Tractor, but BE CAREFUL!! There are TWO different caps!! Take a look inside of the cap and see which one you have. Notice that if you reference from where the "clips" attach on the caps, the two brass terminals are in a different place. That's because there are 6 volt distributors and there are 12 volt distributors. Each one has a cap designed to be timed 90 degrees different than the other. Actually the voltage for the cap has nothing to do with voltage of the system, just how the distributor was put together. In other words, if the original electrical system was 6 volt and you tried to convert your system to 12 volt you would still use the 6 volt cap. So a distributor with a 6 volt cap will ALWAYS need a 6 volt cap even if someone ELSE has changed the system to run on 12 volts!! THIS is where you have to be careful when ordering a new cap. Once again, why is the cap voltage important? 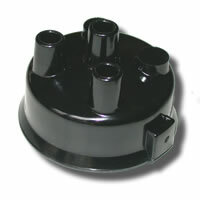 The index built into the cap only allows distributor cap installation in one position. 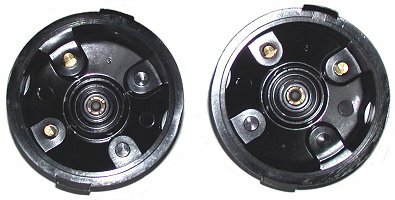 The 6 volt cap is built so that it is timed 90 degrees out of engine timing from the 12 volt cap. Therefore if you have the wrong cap installed in your system your engine won't start or run. If someone has tried to convert the electrical system on your tractor from 6 volts to 12 volts this may further complicate the question. (In this case you still need the 6 volt cap). A voltage change of the battery doesn’t mean you have changed the timing of the distributor. So... Yes, you can get a new cap at Davenport Tractor. BUT... Be sure to order the CORRECT one!! If you need POINTS for a Delco distributor, click HERE.